“If kids never practice digging the big ideas out of texts themselves and always have teachers doing it for them,” teacher and author Harvey Daniels postulates, “how can they ever achieve literary and intellectual independence?” (22). Literature / Reading Circles offer a student-centered framework for student choice and voice in classroom reading routines. Students choose their own reading materials (from a classroom or library collection). Small temporary groups are formed, based on book choice. Different groups read different books. The reading can be assigned as homework or class time can be provided. For example, students can complete 15 minutes of independent, silent reading at the beginning or end of class on Monday through Thursday, in preparation for the group discussion on Friday. Groups meet on a regular, predictable schedule to discuss their reading. Kids use role sheets and written or drawn notes to guide both their reading and discussion. Discussion topics come from the students. Group meetings aim to be open, natural conversations about books, so personal connections, digressions, and open-ended questions are welcome. The teacher serves as a facilitator, not a group member or instructor. Evaluation is by teacher observation and student self-evaluation. A spirit of playfulness and fun pervades the room. When books are finished, readers share with their classmates, and then new groups form around new reading choices (Daniels 18). 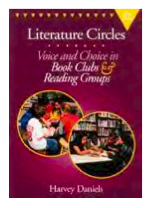 Resources for implementing Reading Circles in the classroom include a Book Menu sample developed by Allison Casper, Book Tasting form developed by Christina Porter, Job Application, Book Application, Self-Assessment, Peer-Assessment, and Reading Circle Portfolio Rubric. Reading Circle Role Sheets vary and can be adapted to the content area and the texts. See Ch. 7 of Daniels’ book for the original collection of role sheets. This website includes Role Sheets adapted by RHS teachers for Reading Nonfiction, Reading Shakespeare, Reading in Biology Class, Viewing and Listening to Media Productions, and Reading Books as a Film Crew. View this example of Reading Circle role sheets adapted to the iPad by RHS Biology teachers Marcie Day and Emily Georges.